Shoestring Elegance: What to do Weekends #221 ~ Happy Easter ~ He is Risen! What to do Weekends #221 ~ Happy Easter ~ He is Risen! Happy Easter weekend! He is Risen! What a wonderful and grateful week. I hope you all enjoy your Easter with your loved ones and are not too harried from Spring Break! Janet at Rosemary and Thyme has my number! 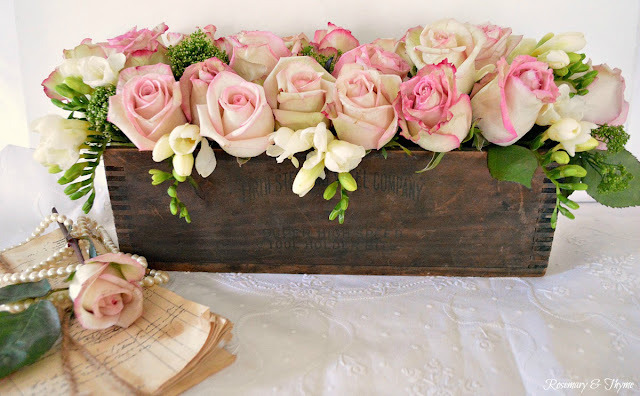 If you want to make me happy, get some beautiful roses and make something like her gorgeous Rustic Wooden Box Floral Arrangement Just so beautiful! What a weonderful centerpiece for celebrating or staring! Ha! More than one view for this beauty! 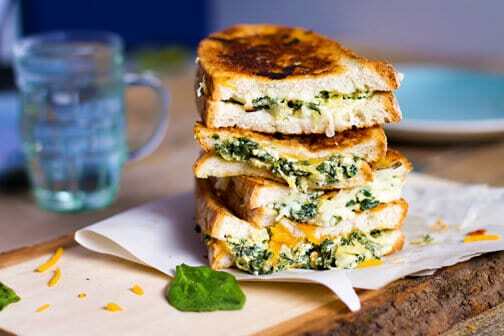 All that Jas had me drooling on my keyboard with this yummy Spinach Artichoke Grilled Cheese!! Now, why don't I ever think of something like this when I'm hungry?!! Faeries and Fauna showed us how to make her absolutely adorable Easter Egg Floral Place Card Holders. So sweet! These would brighten up anyone's Easter Table! Carol at Blu Sky Kitchen shared her absolutey adorable Easter Basket Cupcakes! How fun are these?! Kathryn @ The Dedicated House is sharing her Little Spring Venue, proving you can make things beautiful even when you're in the middle of unpacking at a new house! Congratulations, Kathryn! And, last, but definitely not least, Cecelia from My Thrift Store Addiction reminds us all what this time is truly about with her perfect little 15 Minute Up-cycled Frame. Thank you all so much for being here!! Thank you very much for the feature. Its such a rush to see the picture from your post scroll up onto the screen. Very exciting. I appreciate the opportunity to link up each week and thanks for hosting. Have a beautiful Easter. Thank you, Leanna! Happy Easter! I'm so glad you are pleased. I loved your little egg-less ;) namecards! Thanks a bunch for featuring my grilled cheese! I am thrilled and honored! Easter blessings to you! I can't wait to try your grilled cheese, Jas! Easter blessings to you as well! Thank you so much, Regina! Happy Easter! Thanks so much for hosting!! Happy Easter!! Happy Easter, Debbie! I'm so glad you are here! He is risen indeed! Amen. It's my pleasure, Monika! Happy Easter to you and yours. Thank you so much, Marilyn! Happy Easter to you and yours, as well. Many blessings for this wonderful day! 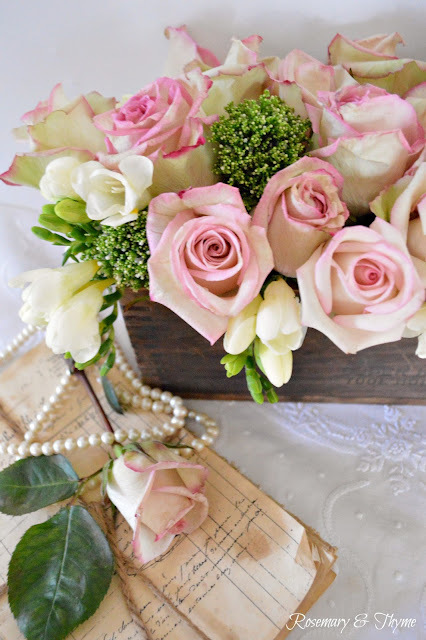 I LOVE the arrangement of the pink roses in the wooden box. I want to save it to Pinterest but I can't figure out how to do it. Should I do it from a different page or what? Hi Naomi. You can definitely save it to Pinterest! You should be able to do that by hovering your cursor over the image until you see the red P. If you aren't able to do that, I suggest you click on the link that says, "Rustic Wooden Box Floral...." that will take you to Janet's page and you can pin it right there! Thanks for asking! Happy Easter! Thanks for the party, Theresa! I hope you have a beautiful Easter weekend! 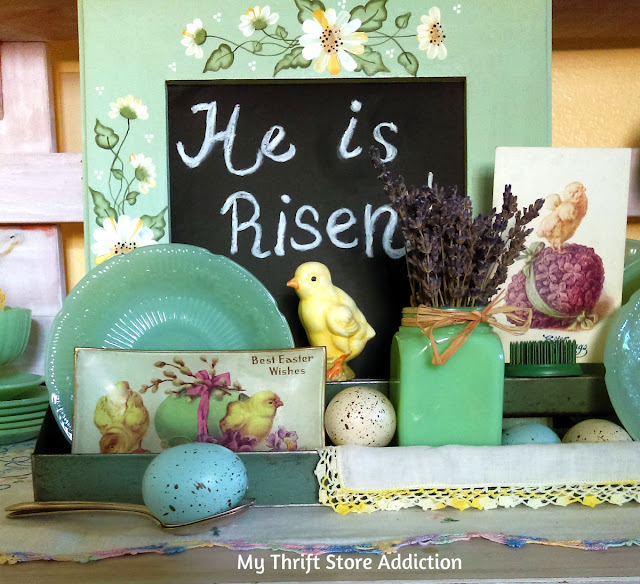 Hi Theresa, thanks so much for featuring my upcycled chalkboard, He is risen indeed! My pleasure, it was a true joy! Happy Easter to you and yours Theresa! Thank you, Uwe! Easter and Spring greetings to you as well. Thanks for the party, Theresa and wishing you a Happy Easter!